Infracontrol is an independent system integrator, specializing in IT solutions for society’s infrastructure. We help create a society that functions better through IT solutions that are more user-friendly, useful and intelligent. We make sure technology is here to help people and not vice versa through our special focus on utility. Our system solutions contribute to a more intelligent infrastructure that results in enhanced safety, reduced environmental impact, an improved working environment and better use of society’s investments. Infracontrol has approximately 30 employees and annual sales of around SEK 60 million EUR 6 million. Our head office is in Mölndal, Sweden and we have local offices in Stockholm, Lisbon (Portugal) and Madrid (Spain). Our customers consist of national and local public works departments with responsibility for society’s infrastructure. All of us want everyday life to be plain sailing and as simple as possible. Why else would society have all of the technical aids such as computers, cellphones and other technologies it uses? But we often discover that all these smart solutions complicate things more often than they simplify them. We aim to change that. In the future everything will be much simpler. Come join us. Our tried-and-tested project model developed in-house helps us implement projects as simply and efficiently as possible and always with a focus on the users. We developed it because we feel technology too often takes over at the expense of the users and the advantages they actually seek to achieve. The project model entails putting user expertise and experience to good use and integrating it into the solutions and functions subsequently used. It’s also a good way of safeguarding the benefits of investments in new support systems as the model encourages involvement and wins the support of users right from the beginning. Seeking to achieve the lowest environmental impact possible within the company. Among other things, this involves coordinating travel and working to reduce the amount of consumables used. Including environmental aspects in our assignments as one of the requirements placed on equipment and the choice of materials and functions, and by proposing technical solutions that help reduce energy consumption. 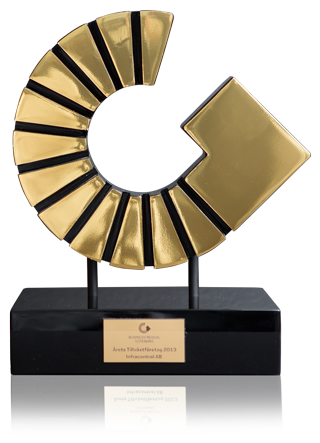 Infracontrol was named Growth Company of the Year 2013 by Business Region Göteborg, an organization responsible for the development of commerce in the and 13 other municipalities in the region. Infracontrol was one of three nominated companies chosen from the more than 500 SMEs participating in the Expedition Forward growth program. This company has achieved fantastic development through single-minded effort right from the start. It’s clear, inspired vision and well-founded brand platform has allowed it to focus on what is important. Combined with clear leadership, this has resulted in the development of a company culture in which people have fun at work; employees enjoy job satisfaction and stay. Growth Company of the Year 2013 is definitely a stable basis upon which to continue its success. 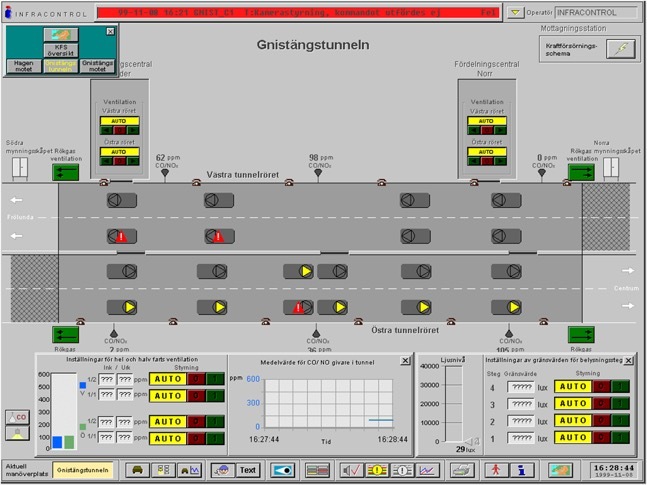 In 1993 we had a great idea – why not get all the technical installations in our infrastructure connected somehow in order for us to better monitor and control the functions that are so important for our society. Instead of expensive, specially developed monitoring and control solutions we could use modern, reliable technology from industry. No sooner said than done. The idea became Infracontrol. Read more about the first big projects that led to our work on creating a more intelligent infrastructure here. Infracontrol replaces the old control equipment from the 1960s with new, programmable control systems. Results include improved air quality and enhanced tunnel safety. Meanwhile, the first general platform for remote control and monitoring is introduced at the Swedish Transport Administration in Gothenburg. The platform has since been developed and grown in scope to form one of the more important parts of the Swedish Transport Administration’s Traffic Information Center, TIC. The center manages not only all of the tunnels in Gothenburg, but also traffic information signs, CCTV cameras, variable speed limit signs and pumping stations etc. 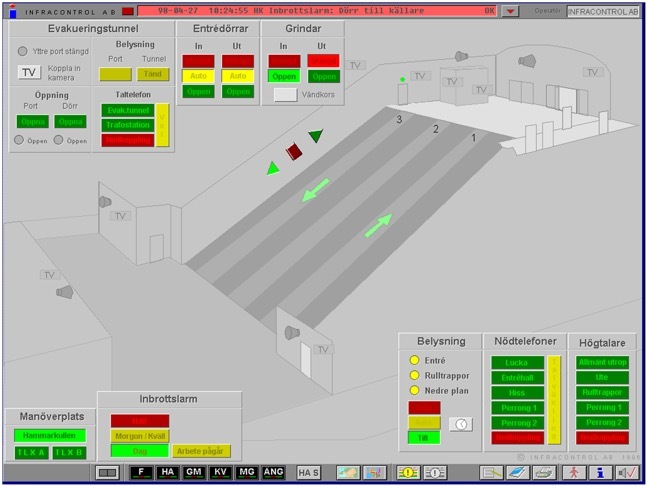 In collaboration with Gatubolaget, Infracontrol is installing a new computer-based control system with a graphical interface. Barriers and signals, lock gate control and the registration of passing vessels are now simpler to manage. The solution is unique and now constitutes the design standard for remote control systems for bridges. Since then, the system has undergone a few small upgrades and additions but remains an excellent example of Infracontrol’s inherent ability to create future-proof solutions. 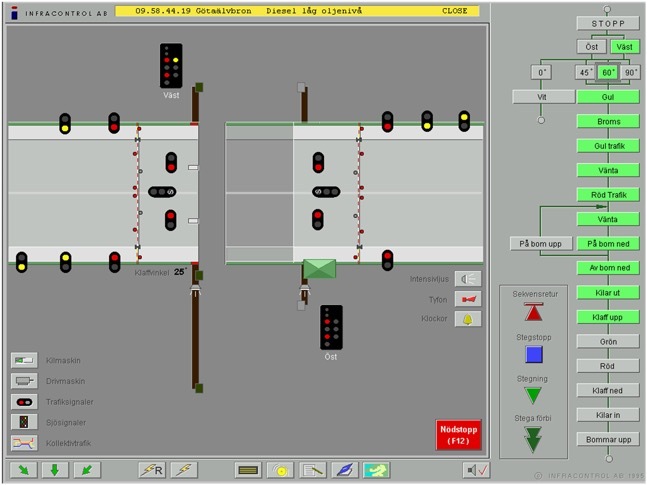 When the decision is taken to remotely control Hammarkullen Station, the Traffic Department faces a dilemma: how can all of the different technical systems be gathered together and managed safely from a single location? Infracontrol analyzes user requirements and creates the solution. The company introduces an industrial control and monitoring system that allows all of the station’s functions to be handled in a safe, transparent manner by means of CCTV cameras, telephones, alarms and control systems. The solution remains in operation today, albeit with a number of upgrades during the 20 years that have passed. In 1996, the City of Gothenburg Traffic Department already has a system that shows departure times on electronic signs at a number of stops. Now it wanted to extend the system to provide the same information right across the city. Infracontrol is assigned the task of creating a general platform that can also act as a support system for information operatives at G-TIC, Gothenburg’s Traffic Information Center. 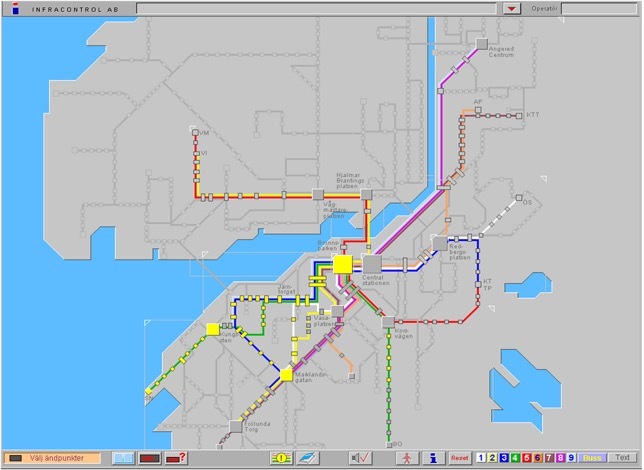 Today the system is owned and operated by Västtrafik, but the information seen by people at the stops is based on the principles Infracontrol helped to develop more than a decade ago.